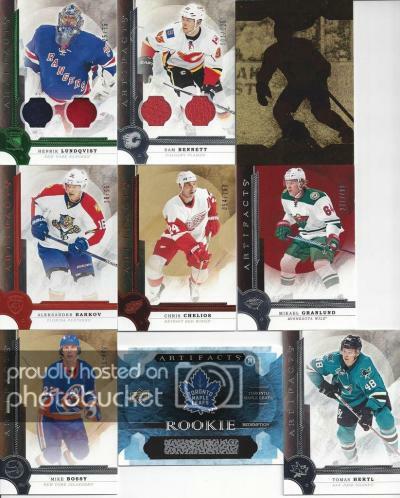 Leafs Rookie redemption (Red-207) -- anyone know who these are yet? But at least it wasn't all bad. I did get a Hertl base card! Yeeeehh! Of course, anything in my Hertl wantlist in my sig. That Leafs redemption is a pretty big hit, no? Going for about $80 CAD on Ebay. Congrats :) On the Leafs redemption .... and the Hertl base! Aurum is Latin for Gold. That's why it is AU on the Periodic Table of Elements. Not sure if you are needed the 2016-17 Artifacts Autograph Materials Gold Spectrum #37 Tomas Hertl #'d 3/5 - looking for Neely in return. A scan of this card is in my Artifacts box break thread. Lundqvist is a minor jersey?? Well, it's not going to be Mathews because he is going to be the "I" card. They have five others in the regular set. So who does that leave? I guess if its Marner, maybe it aint so bad. But knowing my luck, it will be Hyman or someone we haven't seen yet. Very nice card, but I already have one (#5). The only Artifacts I need are the ones listed.